Winter isn’t over yet! Be prepared for those unexpected snow flurries and freezing temps with this yummy crockpot chicken tortilla soup made with chicken and white beans. I made this soup on my snow day a couple of weeks ago. I meant to make a white bean chili, but I didn’t have all the ingredients, so I switched gears and created this crockpot chicken tortilla soup. It turned out lovely! This soup is easy to make and healthy. 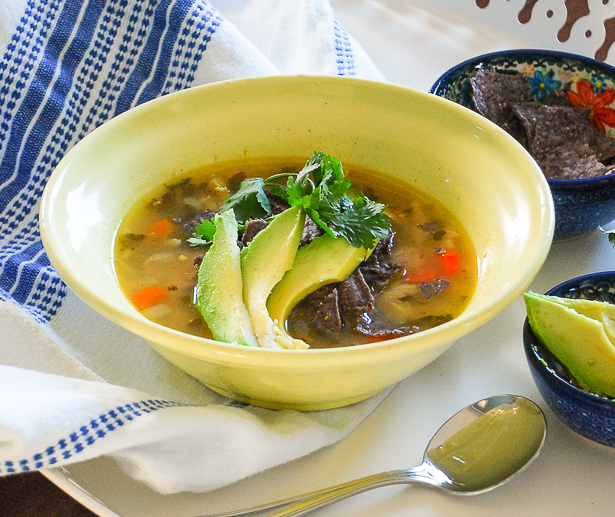 With loads of smoky flavor from the cumin and turmeric, a touch of spicy heat from jalapeño, and the buttery-ness of the avocado your family is sure to love this crockpot soup. 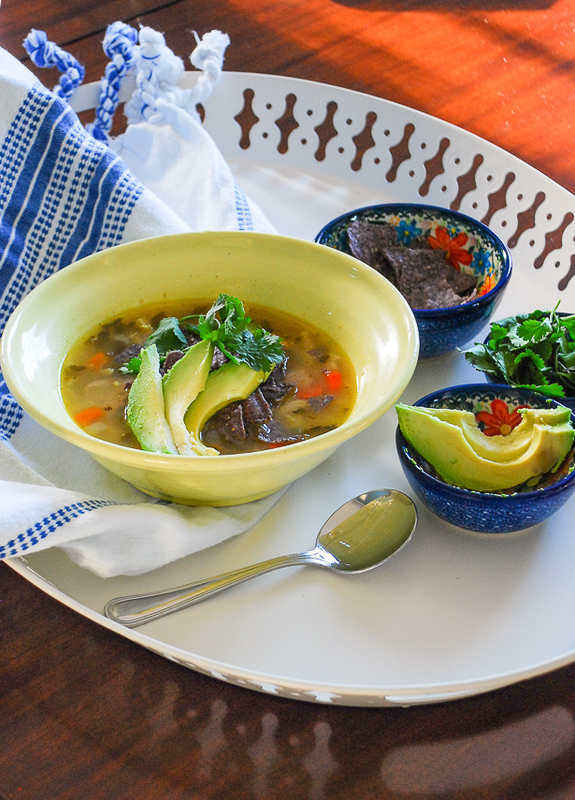 Piling on the tortillas, avocado, and cilantro for toppers makes the soup extra special! First turn your crockpot on high and place your chicken (thighs and breast) in the pot. Pour the chicken broth on top. Cook chicken for 60 minutes until done. Once cooked, pull out the bone-in breast and remove the bone roughly shredding the meat. Put the chicken back in the pot and pull apart the rest of the meat with 2 forks. In the meantime, chop all your veggies. Sauté the onion, jalapeños, and a fistful of cilantro in a little dab of EVOO. As the onion turns translucent mix in the cumin, turmeric, and dash of red pepper. After the chicken is cooked, add the onion sauté, carrots, and beans to the crockpot. Cook on high for an hour or so until soup is bubbly and then add the bell pepper. Turn the soup down to low or warm until ready to serve. For the toppings, slice the avocado, crunch up some tortilla chips, and chop some cilantro. Place in bowls and allow everyone to add their own. If you are a fan of citrus, add a few slices of lime to the topping choices. This will add a nice burst of zesty flavor to the avocado. Sounds yummy! We love soup and I’m always looking for a new recipe to try. Thanks Paula! I think you will enjoy it!